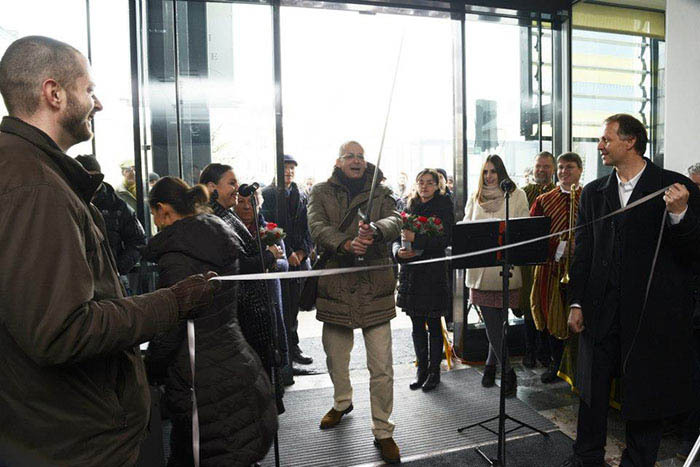 The sword N4516 from Ljubljana is contemporary to the struggle of its Slovenian population for their own identity with the bordering states of the Habsburg Austro-Hungarian Holy Roman Empire. The periodic incursions from the Ottoman Empire and the internecine warfare between the various branches of the Habsburgs, as well as the other noble families, created a tumultuous period in Slovene history. 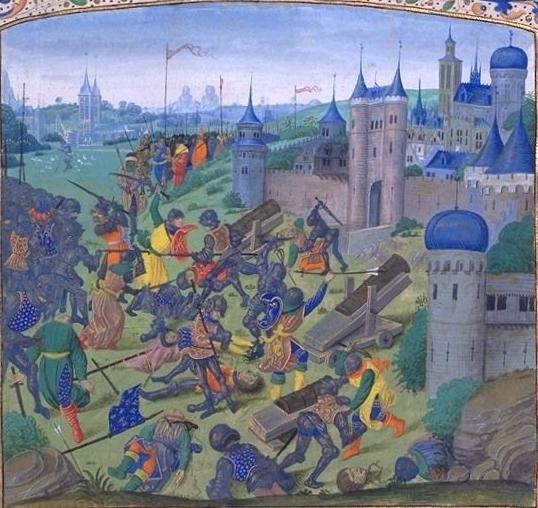 During the 1396 Battle of Nicopolis against the Ottoman Empire, Count Hermann II of Cilli (Cilje) saved the life of King Sigismund of Hungary, the son of late Emperor Charles IV. As a reward the king donated (1397–99) the city of Varazdin, the county of Zagorje, and many estates in Croatia to the family. In 1401 the Counts of Cilli were among Sigismund's supporters against the rebellious Hungarian magnates. Their alliance with the Imperial House of Luxembourg became even closer through the marriage of Hermann's daughter Barbara of Cilli to the king in 1405. In 1418 Count Hermann II inherited the Carinthian and Carniolan estates of the extinct Counts of Ortenburg. In 1410 Sigismund had been elected King of the Romans and was crowned Holy Roman Emperor in 1433. In 1436 he elevated the Counts of Cilli (Celje) to the rank of Princes of the Holy Roman Empire (although they retained their title of Graf (Slovene: grof)). The Habsburgs, whose strongest rivals they had become, reacted with a war that lasted until 1443, when an agreement of mutual inheritance was signed. Count Ulrich II of Cilli was the most powerful member of the Cilli family. Ulrich held a large influence in many courts, which originated from the relationships the Cilli family had made in the past. Upon the death of the Habsburg king Albert II in 1439, he tried to get regency of Hungary, Bohemia and Austria through control over Albert's minor son Ladislaus the Posthumous. After an unsuccessful claim to the Bosnian crown, Cilli obtained some territories in Croatia and Slavonia and in 1452 finally succeeded in forcing Emperor Frederick III to hand over the boy king Ladislaus to his keeping. Thus, Ulrich II became de facto regent of Hungary. In 1456 after the death of his rival John Hunyadi, Ulrich II succeeded him as Captain General of Hungary. 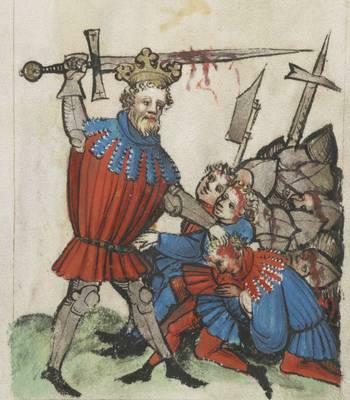 That initiated a plot by the Hunyadi family against Ulrich II, and he was assassinated by the men of John Hunyadi's son Ladislaus on 8 November in Belgrade. Speculum Humanae Salvationis from 1427. An online publication of the whole manuscript can be found here. 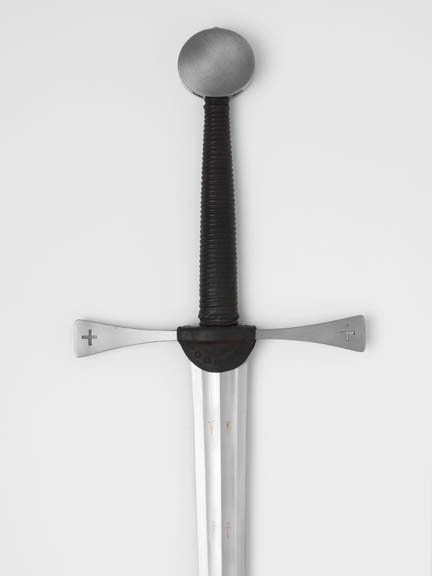 The sword N4516 is an unusually fine example of the sword smiths craft. It is masterfully made and an ingenious work of design in the Gothic tradition. Peter documenting the original sword N4516. You can tell it was made by some of the best craftsmen of its day. There is an economy in form and expression that does not take away anything of its power of presence. Rather it makes its character come out even stronger. The shape is stark and graceful with something very essential about it. It is close to the ideal idea of what a sword of this kind should be. "Visible things derive from the invisible" was said by Odo (c. 1116 - 1161), the Abbot of Morimond and an early Cistercian. There is a strong influence of Christian Platonist philosophy in medieval aesthetic ideals. An important part of work was to bring its completeness as close as possible to this invisible ideal origin. Important works of art and architecture were designed based on geometric structures. Geometry was nothing less than the rational rules that the creator Himself followed in the making of Creation. The practical use of geometric drawing was a method in many crafts to varying levels. Most famous for their ingenious use of geometry are the architects of the great Abbeys and Cathedrals, but also goldsmiths and painters are known to have used geometry when planning work and establishing its proportions. My hypothesis is that it was also an important part of the craft of sword making. If it is possible to rediscover how this was done and unlock the secrets of the old masters, we will learn something new and important about medieval swords. Geometrical drawing was simply a handy and practical way of working in an age that lacked standardized units of measurement and pre-fabricated bar stock. Every craftsman had to be able to set down the basic fundament himself: establishing true angles and correct proportions. This was done with the help of a compass and a straight edge. Theophilus tells us how to lay out a design on a chalked plank with straight edge and a compass with a point of tin or lead. 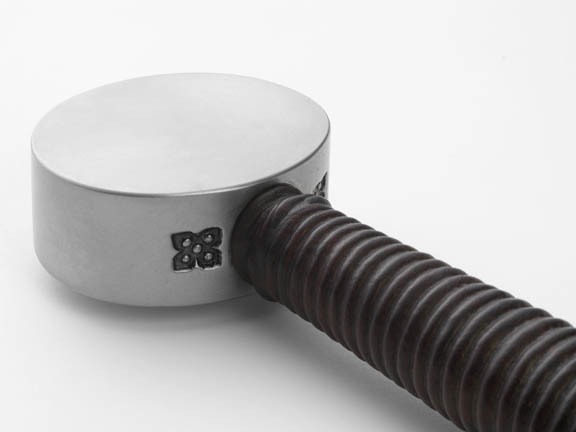 Number and geometry was also charged with symbolic meaning ("The search for the inner meaning of things was a medieval habit", says Nigel Hiscock: The Symbol at Your Door, 2007). We cannot know how important the symbolic meaning was in each individual case of course, and we must be careful about how much we read into these things. It would probably have varied over time and between individuals. But we cannot overlook the fact that symbolic meaning did play a big role in how reality was perceived by the medieval mind. With the drawing of the n4516 rolled up under my arm I was eager to come home to see if a geometric structure may have been the basis for its proportions. Not all swords have clear geometric ratios for their proportions. This one turned out to be a very interesting example, but a difficult nut to crack. When there is a finished analysis that define all the parts, the solution seems obvious. But it is not always easy or even possible to find this simple solution. Geometry can be made to "explain" almost any form, but it is not always possible to do this in the simple and elegant way you see in the work of medieval engineers and artisans. The Ljubljana does indeem seem to have been designed according to a geometric system. The search was now to see if I could find principles of design that could have been established with compass and straight edge and not a pocket calculator. I think that this seeming closeness with the golden section is a side effect of a different method that has much in common with the geometric structures that were used in the planning of great cathedrals. Geometry was a "free and liberal art" but this did not mean there were no rules involved. When we look at preserved architectural plans we can see how certain stratagems and methods were commonly used to establish harmonious proportions, "so that out of all the parts (...) there emerges one single wholeness of things" in the words of Augustinus. The octagon, the vesica and the progressive scaling of rotated and inscribed squares are among the most common geometric elements found in architectural drawings of the Gothic period. For an analysis to be valid it has to describe both the overall and be able to define the details, with an economy of elements, since this is what we see in surviving medieval geometric designs. For more information about sword N4516 from Ljubljana, Peter Johnsson's short article about the sword's intricate geometry is available for download here. 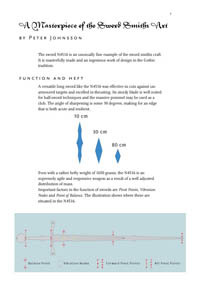 Peter Johnsson's short video illustrating the sword's intricate geometry. A versatile long sword like the N4516 was effective in cuts against unarmoured targets and excelled in thrusting. Its sturdy blade is well suited for half-sword techniques and the massive pommel may be used as a club. The angle of sharpening is some 30 degrees, making for an edge that is both acute and resilient. Even with a rather hefty weight of 1650 grams, the N4516 is an supremely agile and responsive weapon as a result of a well adjusted distribution of mass. 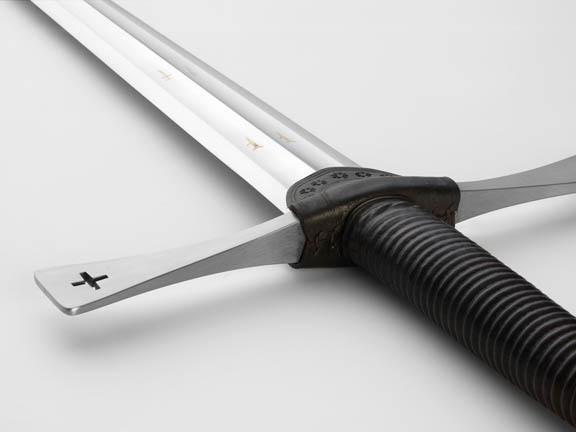 Albion's recreation of this sword from Peter's detailed documentation is exact in every detail to the original sword. 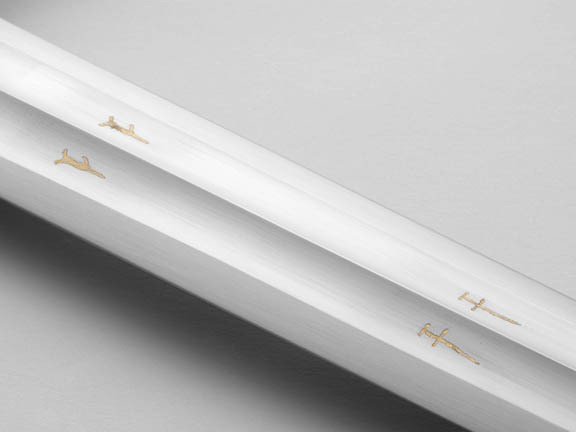 This sword is offered in a limited edition of 1,000 swords worldwide.